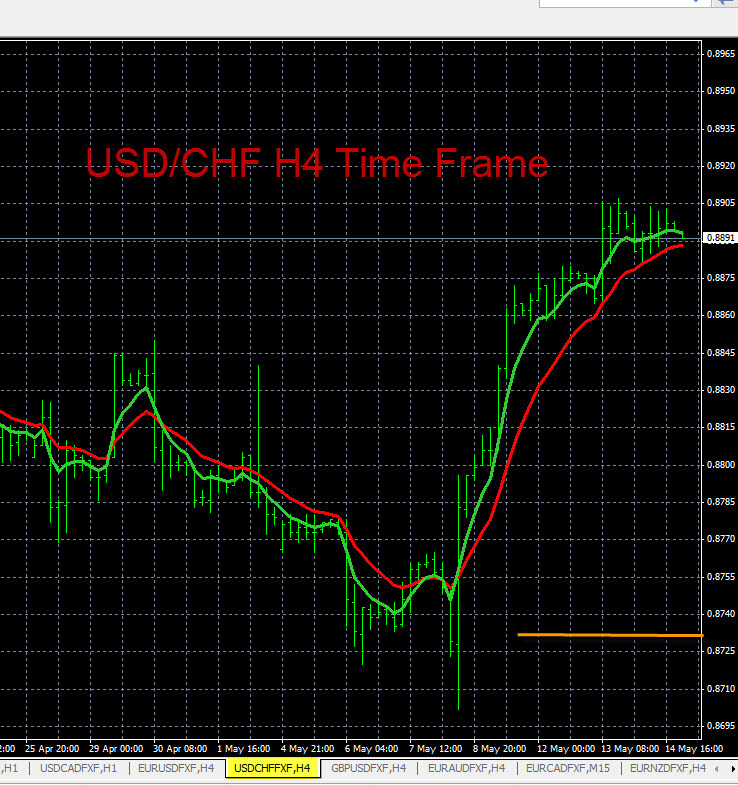 The USD/CHF is close to starting a new trend in the D1 time frame, check the trend chart below. Traders can set a price alert at 0.9950, as indicated by the red line. Above that price check The Forex Heatmap® to verify any buy trade entries. The overall trend on this pair is up, and we expect it to go back up to at least the 1.0300 area resistance area indicated on the chart. The resistance alarm point and target resistance areas are noted in red. This chart is exponential moving averages, and they can be applied to all 28 pairs we follow. Then you can conduct a trend analysis across all 9 meta trader time frames with multiple time frame analysis. Today in currency trading the USD/CHF moved much higher after the USD economic news announcements. 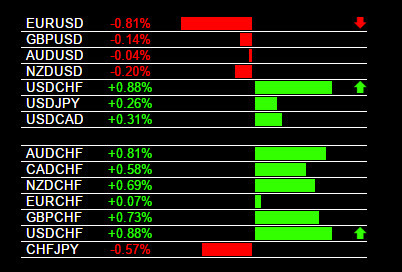 After the news drivers in the main trading session the USD (US Dollar) strengthened somewhat but the CHF (Swiss Franc) was weak, pushing the USD/CHF higher. The USD/CHF has hit intra-day highs of 1.0093. Core Retail Sales and Producer price index were the USD news drivers at 830 EST. The USD/CHF is trending higher on the major time frames and has considerable upside potential. The live currency trading signals you see below are from The Forex Heatmap®, which is a visual map of the forex market, it provides live trading signals for 28 pairs. Today in currency trading the CHF (Swiss Franc) strength was signaled by The Forex Heatmap®. This drove price movement for traders. The USD (US Dollar) also had some weakness. The USD/CHF dropped and broke one support level. This pair should continue lower to the next support level at 0.9200 but it should continue past there. The CHF/JPY also rose on the CHF strength, we would scale out lots on this pair just below the 130.00 area, which is the next resistance point. The trading signals you see below are from The Forex Heatmap®, which provides live entry signals for 28 pairs. The USD/CHF is not in a trend now. The analysis indicates that this pair is consolidating and is going sideways, therefore, to catch the next move we are setting a straddle alarm on this pair at 0.9200 and 0.9300 to catch movement in either direction. A further discussion of price alarms is available for review. After the alarm hits you can verify the trade entry with The Forex Heatmap®. There is plenty of room to move in either direction as there is no nearby support or resistance past the straddle alarm prices. The trend indicators you see are exponential moving averages. 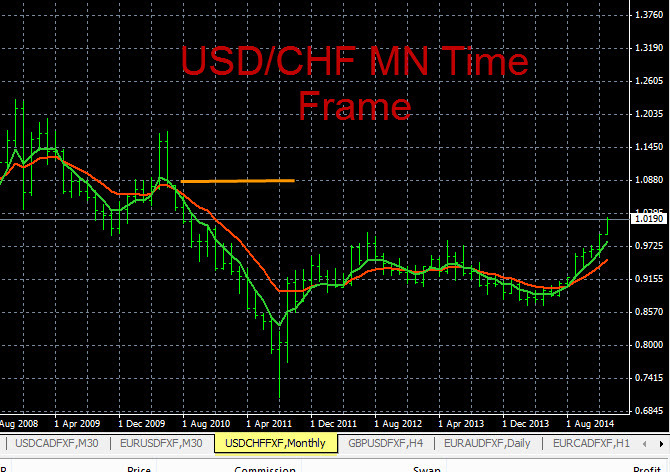 The USD/CHF chart analysis shows that this pair is trending higher is trending higher on the largest time frames, like the MN time frame shown below. The current resistance is at 1.0225. You can set a price alert here. When the alert hits check The Forex Heatmap® for a buy signal. We do not see any resistance past the alert price nearby plus considerable upside potential of over 600 pips. The chart analysis you see below was performed with multiple time frame analysis. 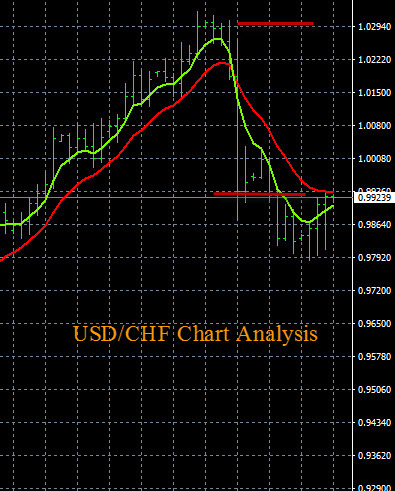 The USD/CHF chart analysis is shown below. This pair is in a down trend on the larger time frames, like the W1 time frame. It has cycled up on the H4 time frame and we now expect it to cycle back down and get back into the longer term down trend. It should drop back down to the 0.8730 support area, shown by the yellow line, and eventually continue much lower. Look for a sell signal on this pair in the main trading session using The Forex Heatmap®. The chart system you see below is the meta trader platform with 5/12 exponential moving averages. Today in currency trading the USD strength was evident in the market. The AUD, EUR and CHF were slightly weak and this drove short term movement on several pairs. The EUR/USD and AUD/USD dropped and the USD/CHF rose. These were short term movements. Due to some market choppiness we would scale out lots or exit all trades. We will look to plan more trades on these three pairs in our next set of trading plans since the D1 trends could be forming in the direction of continuing US Dollar (USD) strength. The trading signals you see below are for The Forex Heatmap®, which give live trading signals across 28 currency pairs. Today in currency trading the forex major pairs all moved based on USD (US Dollar) strength. This created excellent short term buy and sell opportunities on some of these pairs. In the main forex trading session the USD was strong across the board, and pairs like the USD/CHF moved up and the EUR/USD moved down based on the USD strength. From a support and resistance analysis, these two pairs are range bound, so we would consider scaling out lots and taking some profit, as we consider these to be short term or intraday trades. The live currency strength indicator you see below is The Forex Heatmap®. It give live buy and sell signals on the forex major pairs, plus pairs from eight other currency groups. The forex major pairs are currency pairs that have the USD on the left or right, the base or cross currency. You can see in the heatmap image above that we trade seven major pairs total. The USD pairs are most popular forex pairs. They are also the most liquid and heavily traded, they have the highest trading volumes and liquidity. The heatmap is a valuable tool in that the signals you see are live and any forex trader can learn how to use it for successful trade entries, day after day. USD strength can be easily detected with this great live indicator. In the example above the pairs with the USD on the left are all green, and the pairs with the USD on the right are all red, indicating that the USD is strong. The heatmap works the same way for other currencies, for example if the EUR (Euro) is strong all of the indicators will be green because the EUR is the base currency on all pairs.